Joining Soulemama this week, one image that tells a little story about our family. A single image that reminds me how special the ordinary is. Wishing everyone a lovely end to the week and a restful, refreshing weekend. hm, yum, snow! i remember that! Ohhh, just what we are missing at the moment…snow.. Thanks for your comment too. Also, I hope that’s not “yellow” snow that someone decided to taste. It’s definitely NOT lemon. Great photo! I love the way they form a circle and the way Winnie blends into the snow. She’s gorgeous. I am ready for snow! Great photo! Super photograph! Nothing like playing out in the snow. Everyone looks like they’re having fun. 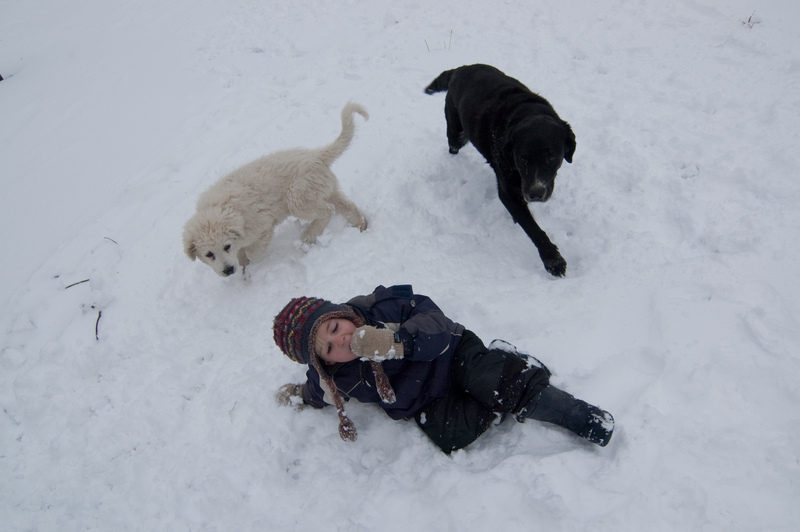 Pups, Children, and Snow….a perfect combination! Thanks for visiting my blog! Happy Weekend! You did teach N about yellow snow, right? Sorry I can’t help it! You know I love your blog and your pictures.